Just steps from The Lafayette Hotel, discover a 1,200 acre, lush, sprawling urban oasis. At Balboa Park you'll find the best San Diego museums and art galleries. You'll also find the famous San Diego Zoo, performing arts venues, beautiful gardens bursting with color and delectable dining spots. 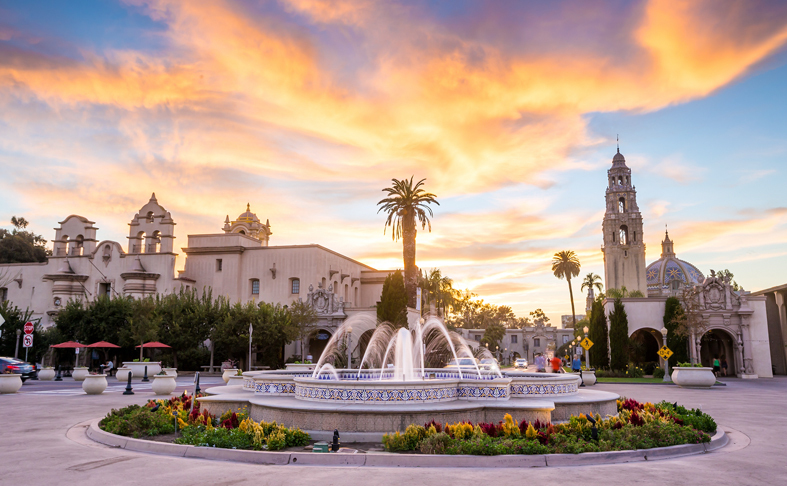 Transform your city stay with a day spent exploring the outdoor art installations, historic architecture and eccentric discoveries only found at Balboa Park. Varies by venue, but the park itself is free to enjoy. The park itself is open 24/7. The Visitor's Center is open 9:30 AM - 4:30 PM daily. Museum hours vary. What are the best musuems to visit in Balboa Park? With 17 museums and cultural attractions, there is bound to be the perfect place for you to explore. Discover the wonders of the planet with interactive exhibits at the Fleet Science Center. Explore global art at the Mingei International Museum. Learn about the history of cars at the San Diego Automotive Museum. There are also specialty museums devoted to minerals, trains, fine & contemporary art, air & space, local history and the evolution of man. What Balboa Park musuems are free on Tuesdays? The best things in life really are free, and that includes the museums at Balboa Park. On a rotating schedule each Tuesday, the museums within the park offer free admission to their permanent collections. Fifth Tuesday: Regular museum pricing in effect. * Note that these museums offer free admission to limited audiences, typically San Diego County residents & active military only.